This essay collection makes me really regret that I never read Grantland, which is now defunct and so I can't anymore. But I can say that Brian Phillips's essays would all appear right at home in a New Yorker issue. 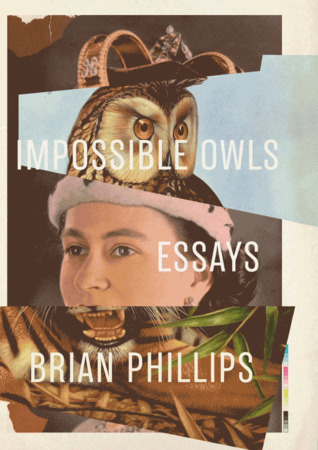 Like some of my favorite nonfiction essay writers from John McPhee to Chuck Klosterman, Phillips's interests are wide-ranging. He covers topics in this book from the Iditarod to Princess Kate to an eccentric rich old woman in his hometown who disappeared for a decade. I think the essay on the current best sumo wrestler was probably my favorite, but it's hard to pick one. I did enjoy the one about the Russian filmmaker the least, but that may have been colored by my own personal frustration with a man who's been working--and not finishing--one project his entire life. I just want to shake him. But the other essays were fascinating and kooky and deep enough that I learned a lot but moved on when they needed to so they didn't get bogged down. Thoroughly enjoyable. This book is published by FSG, a division of Macmillan, my employer.